Does your cat make it his mission to turn every houseplant into his personal snack shack? Why do cats eat green leaves, or if he’s an outdoorsy guy, grass? There’s no clear-cut answer to this question. Rather, there are a few theories. Grass tends to induce vomiting because cats are missing the digestive enzymes required to metabolize plant matter. It’s believed this process helps rid the digestive tract of other items the cat is having a hard time processing. Whether it’s their own fur from grooming or fur leftover from a hunting expedition, cats have a hard time passing hair all the way through their intestinal tracts. Some owners assert cats munch on grass to help move things along. A veterinarian at the University of California-Davis suggests the habit of eating grass comes from centuries of big cats incorporating vegetation into their diets to counteract intestinal parasites. Of course, modern family cats are fed specialized recipes to avoid such health issues, but grass-eating is probably a remnant behavior. Regardless of the why your cat likes to eat grass, the fact remains that he seeks it out. 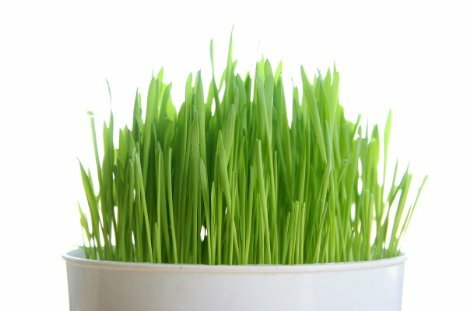 Why not give the pet his own cat-friendly plants, such as cat grass. Most likely your kitty is going to want to honker down among the blades. It’s just what felines do. Choose a container large enough for your cat to snuggle in, but one that’s also shallow so it’s not super easy to knock over . If you start with seeds, you don’t have to worry if the seedlings will survive transplanting. Place the container on a saucer or tray to catch any water that slips through, add a layer of dirt and sprinkle the seeds. Cover the seeds with another light layer of soil. Tip: Spritz the dirt with water before spreading the seeds, so it’s pre-moistened. Loosely cover the mini garden with plastic wrap and store at room temperature. Tip: Avoid placing the container in direct sunlight at first because the heat can become too intense. Water when the soil feels dry to the touch. You should see evidence of sprouts relatively soon. Once you do, remove the plastic and reposition the container to a sunnier spot. When the seedlings reach 3-4 inches, they are cat-ready. To keep you kitty happy, plant pots in intervals. 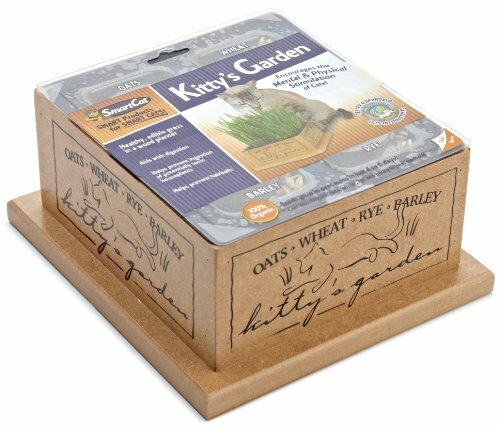 This kit provides everything you need, including 100% organic oats, wheat, rye and barley. A decorative wooden frame is deep enough to prevent spills, but convenient for exploration. These seeds are nearly 100% guaranteed to germinate for you. Also, every batch is tested to make sure they are free of pathogens.